swissmiss | Welcome to the Neighborwood! I agree with Aymie Spitzer in that there is something magical about hand-drawn and hand-lettered maps. 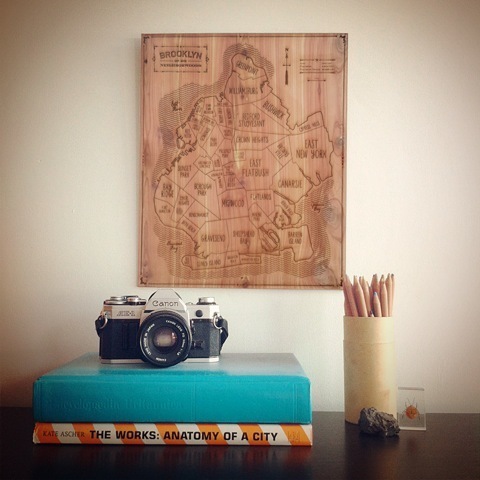 Neighborwoods are hand-drawn and laser engraved into unfinished aromatic cedar. Every map is unique, just like your treasured stories. You can currently get a Neighborwood of Berlin, Barcelona, Brooklyn, Paris, London, Manhattan, Philadelphia and San Francisco. Neighborwoods is a Hyperakt project crafted with love by Aymie Spitzer. This is gorgeous! Definitely gonna get a Bklyn!